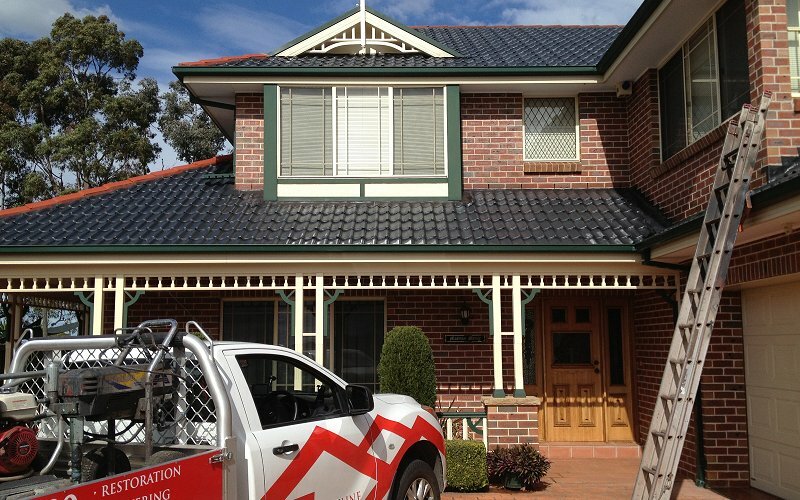 Roofline has been servicing Castle Hill and the surrounding suburbs of Sydney for more than 20 years, providing roof cleaning, roof painting and total roof restoration services. Our team of highly experienced, qualified roofers are punctual and friendly, providing you with exceptional quality roof restoration services using the very latest in equipment and technologies to ensure you receive the safest and most effective results for your home or business premises. Get in touch today to see how we can help or call us to arrange a free, no obligation quote. Roofline can provide you with a number of options for your roof restoration, depending on your budget and the end result you would like to achieve. These range from complete tile replacement and repointing to basic painting and restoration and/or a combination of all of the above services. All work is backed with a 10-year written guarantee on materials and a further 7-year guarantee on our workmanship. We have a professional team of roof restoration experts to provide you with top quality full roof restoration services in Castle Hill. Roofs are exposed to weather extremities causing the roofs to appear worn out as well as cause structural issues if left unkept. Your home is 30% roof, so it is a worthwhile investment keeping it in good condition and ultimately increasing the value of your property. A professional roof restoration service from Rooflines can help bring your roof back to life while saving you the cost of replacement. Roof painting is certainly a great way to rejuvenate your roof, giving it that new look quickly without all the additional costs of a complete restoration. It can also add a tremendous amount of value to your home, which is highly beneficial if you’re looking to sell. In terms of painting, we can assist with virtually any roofing types, including concrete tiles and metal surfaces such as Colorbond®. Roof painting is a meticulous multi-staged procedure that provides a great long-lasting finish. Painting terracotta tiled roofs requires specialized techniques and Roofline is proud to be one of the few Australian companies that specialise in painting terracotta tiled roofs. Get in touch with us today if you’re considering having your roof painted. Roofline’s team of roof cleaning experts are able to transform the look of your roof, instantly improving the appearance particularly if algae, moss and lichen have been left to build up. Our teams have many years of industry experience, so you are assured of expert advice from professional teams who will provide safe and effective services at surprisingly low cost. One of the challenges we find with moss is that it can accumulate in the various rain channels on the roof and lead to gutter overflows and poor drainage. The consequence of this is often water running down the walls of the house, which can lead to a whole new set of potentially expensive moisture problems. Rooflines can ensure a comprehensive high pressure clean of your roof to prevent any unforeseen issues such as these from occurring. Our qualified roof plumbers are equipped to professionally and competently install your home gutters and provide expert advice for complete peace of mind. Our teams have extensive industry experience providing Castle Hill customers with quality installation services and meticulous finishes that is not always delivered by every tradesman in the industry. Rooflines can also assist in terms of providing additional services to make your home look even more beautiful. Roofline has over 20 years’ experience in the industry and utilized effective methods to keep your roof looking its best. We offer a 10-year written guarantee on materials and to further provide you with quality assurances we offer a 7-year guarantee on our workmanship; all at no extra cost. Roofline is fully licenced with a dedicated team of experienced qualified Sydney based professionals who specialize in roofing. We are customer focused and provide individual attention to your roofing needs. We service both commercial and residential properties, catering to a variety of roof repairs, right across Castle Hill and surrounding areas of Sydney.